I bought my Vitamix juicer over a year ago and have use it a few times a week ever since to make many different types of juices. It is fun to mix it up by combining different fruits and vegetables and I love all the different flavors I can create. I also enjoy the idea that I am actually drinking a glass full of nutrients every time I make one of my juices. My husband recently read that drinking beet juice lowers your blood pressure, and though his blood pressure is just borderline high, he decided to give it a try. I found beet juice at our local organic store for him to try, but found it quite expensive so I decided to make my own at home. Since the flavor of raw beets can be a little strong, I decided to combine them with some mixed berries to increase the antioxidant potential along with a piece of ginger and lemon. I added a little pomegranate juice to thin it out, and just a little blue agave sweetener. 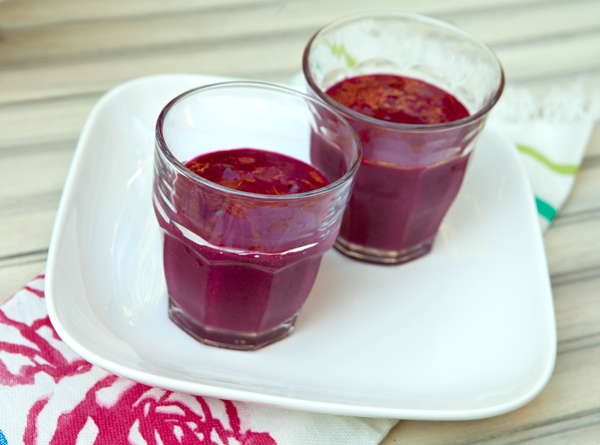 This is a power packed drink with lots of antioxidant properties that will help protect your cardio vascular health. Of Interest – The results of a study published in the February issue of the American Heart Association’s medical journal, Hypertension, demonstrated that drinking two cups of beetroot juice daily significantly reduced blood pressure in healthy volunteers. Place your ingredients into your juicer except the juice and agave and blend until smooth. Use as much of the pomegranate juice as needed to thin to your desired consistency, and sweeten with the agave if desired.